After writing the recipe down, even I was thinking oh my…such a long recipe!! Trust me; it’s a very easy preparation. Just read through the whole method and you will see. See notes too. Add oil to a large pan. Add cinnamon, bay leaf, cloves, cardamom, mace. When it starts to crackle, add water, rice, coriander leaves, mint leaves and salt. The water should be salty to taste. When bubbles start to appear, close the lid tightly and lower the flame to low. (Not lowest, but less than medium) Don’t open until 10 minutes is completely over. Open the lid and give the rice a gentle stir, if there is any little water left, (which is very unlikely) cover and cook for 5 minutes more and take off the flame. Don’t stir the rice too much as this will result in sticky rice. Fluff with a fork and discard mint, coriander and the whole spices. In another pan, heat oil and add the whole spices for masala. Add onions and saute till almost brown. Add ginger/garlic paste and green chilies. Keep medium flame and stir till the raw smell goes. Add a handful of chopped coriander and mint leaves and mix well. Add marinated chicken pieces along with the marinade. Stir on high flame for few minutes. Cook on medium flame till chicken is fully cooked and the gravy is thick. Check salt and take off fire. In a large serving dish, spread some rice. Sprinkle coriander leaves, mint leaves and some fried onions. 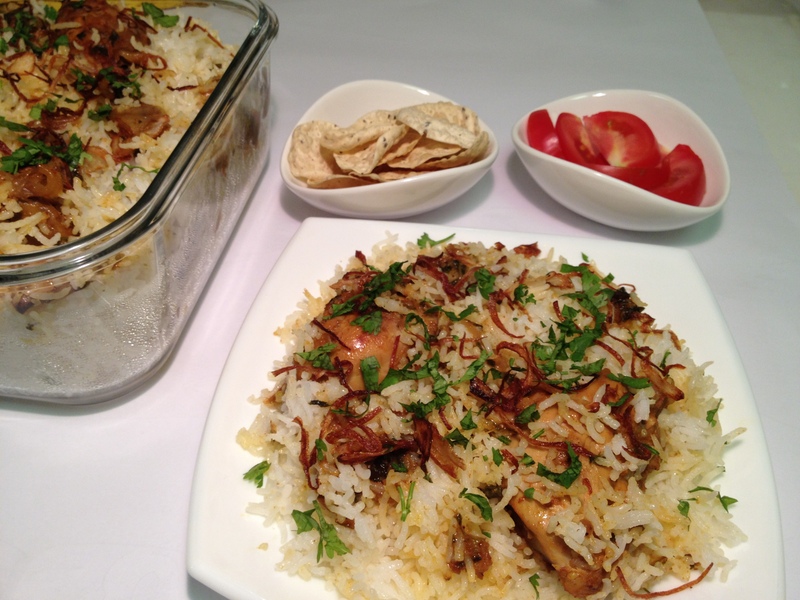 (Sprinkle dollops of ghee in 3-4 places –optional) Spread chicken pieces on top and layer rice again. Do 2 such layers. Cover with aluminium foil and bake for 10 mins in a preheated oven at 150 degree Celsius. 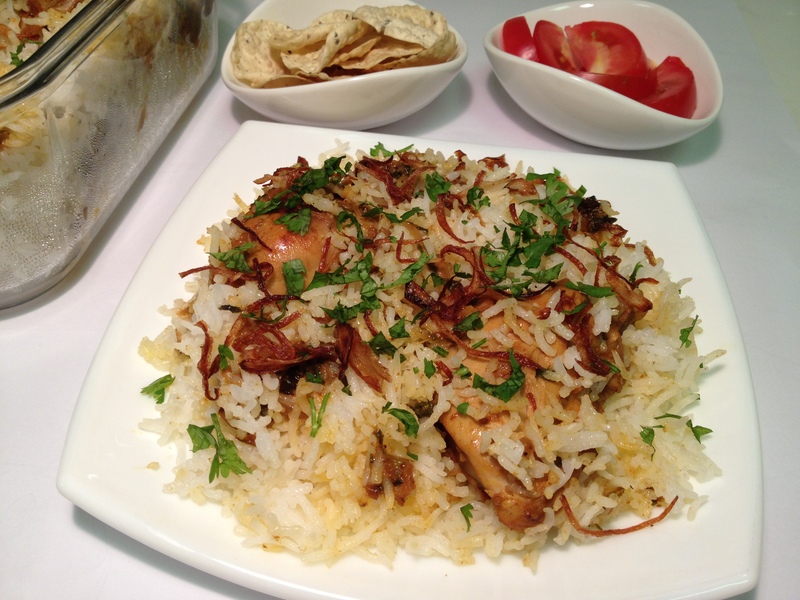 Alternately, layer the rice and chicken in a vessel and place on stove top on low flame for 10-15 mins. Serve with raita, papad and pickle. I have used oil for cooking here, but ghee is preferable. 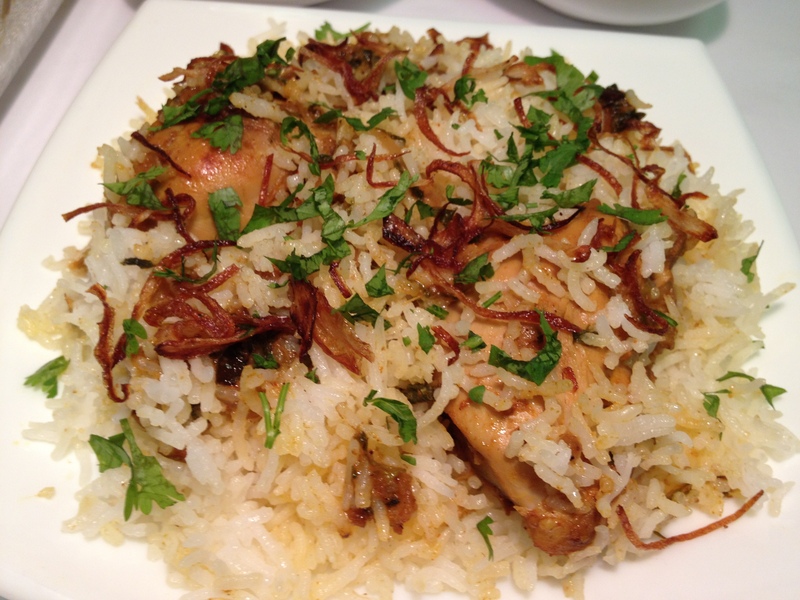 Few things are optional like soaking the rice and frying in oil before adding water. I don’t do either. Fry extra onions for garnish and store some in the refrigerator, Few sprinkles of fried onions on many foods will change the smell and appearance.